The digital camera wasn't invented overnight or it's schematics written down on a napkin during lunch break. Some cameras were made from scratch, others meticulously designed. Some prototypes were manufactured and marketed, others only saw the neon lights of tech fairs and became vaporware. Here is an overview of the prototypes and rarities that I discovered during my researches. These are certainly not all the prototypes ever built but I try to get close. Please note that you might discover some cameras that I deem prototypes because I have no proof that these cameras were actually sold or marketed! All information on this page and on my other pages is thoroughly researched, cross-referenced and verified before posted! If you can prove me wrong, please drop me a line. Some prototypes can be seen here for the very first time on the internet, ever! All images can be enlarged by clicking on them, enlarging them will also show the respected copyrights. 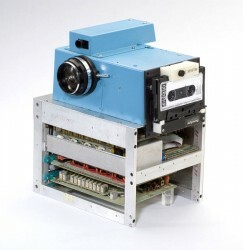 To the left you can see the most famous prototype of all times, the 1975 Kodak Prototype.